After the Israelites left Egypt, they traveled through the country of the Moabites on their way to the promise land (Numbers 22:1). The king of the Moabites was afraid of the Israelites and asked a prophet named Balaam to curse them (vv. 3–6). As Balaam was on his way to do so, “the angel of the Lord” stopped him, sword in hand (v. 22–23). However, this angel did not do what we might have expected him to do: mention who he was. This may seem strange to modern readers who are used to knowing the names of angels, such as Gabriel, Raphael, and Michael. However, angels in the early books of the Old Testament almost always go unnamed. As biblical scholar Carol A. Newsom has noted, “in contrast to later writings,” texts from before the destruction of Jerusalem by the Babylonians “exhibit almost no interest in the heavenly messengers themselves. They are not individuated in any way. They do not have personal names.” Angels play a significant role in 29 chapters of these pre-exilic portions of the Bible. In all of these instances, the angels are referred to simply as an “angel of God” or an “angel of the Lord,” except in one instance when the angel is described as the “angel which redeemed me from all evil” (Genesis 48:16). In fact, it is sometimes difficult even to tell the difference between an angel and God Himself. In Exodus 3:2–4, for example, “the angel of the Lord” appeared to Moses “in a flame of fire out of the midst of a bush. … And Moses said, I will now turn aside, and see … why the bush is not burnt. And … God called unto him out of the midst of the bush, and said, Moses, Moses. And he said, Here am I.” In these verses, it seems clear that the “angel of the Lord” is actually God Himself. Eventually, named angels would become more common. In the book of Daniel and the New Testament, one begins to find angels being referred to by name, but when Lehi left Jerusalem, biblical texts rarely recorded the names of angels. One sees this pattern of angels going unnamed throughout the Book of Mormon as well. Angels are mentioned 145 times in the Book of Mormon, yet their names are never given. The closest the reader gets to know the identity of an angel is in Alma 8:15, in which an angel told Alma the Younger that he was the same angel that had appeared to him earlier. 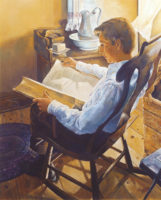 Just as in the Old Testament, angels in the Book of Mormon are known simply as an “angel of the Lord” or an “angel of God.” Because Lehi left Jerusalem around 600 B.C., it makes sense that the Book of Mormon would reflect this more ancient view of angels, even though it may be surprising to modern readers. The way angels are depicted in the Book of Mormon and the Old Testament reminds us of an important truth: the identity of the person speaking truth is sometimes less important than the truths being spoken. In life, we often find ourselves in situations where we are being taught by various people. Some of these people might be ministering brothers and sisters sharing a message or members of our congregations giving a talk in sacrament meeting. At other times, we might be taught by the wise words of a small child or a grandparent. At times, even the words of strangers can be surprisingly impactful. Yet in all these cases, focusing more on the messenger than the message could cause us to miss something important. By listening with the Spirit to those around us, regardless of their identity, we can learn profound truths from the people we interact with every day. The people that had encounters with angels in the Old Testament and the Book of Mormon did not record the names of the angels that were communicating with them. But that did not matter. What mattered is that they were messengers from God, sent to tell them something important. The angel speaking to Balaam spoke for God, and Balaam treated him accordingly, regardless of his actual identity. We could do the same in our own lives, listening carefully to those around us and applying the truths they teach us to our own lives, no matter who they are. For more on angels in general, see Donald W. Parry, Angels: Agents of Light, Love, and Power (Salt Lake City, UT: Deseret Book, 2013). Carol A. Newsom, “Angels,” in Anchor Bible Dictionary, ed. David Noel Freedman, 6 vols. (New Haven, CT: Yale University Press, 1992), 1:250. See appendix. See also, Taylor Halverson, “The Path of Angels: A Biblical Pattern for the Role of Angels in Physical Salvation,” The Gospel of Jesus Christ in the Old Testament, The 38th Annual BYU Sidney B. Sperry Symposium (Provo, UT: Religioius Studies Center, Brigham Youngg University, 2009). For more on the role of angels in the Book of Mormon, see Book of Mormon Central, “Why Does God Sometimes Send Angels to Help People? (Alma 24:14),” KnoWhy 360 (September 1, 2017); Book of Mormon Central, “Why Does Mormon State that ‘Angels Did Appear unto Wise Men’? (Helaman 16:14),” KnoWhy 187 (September 14, 2016). Eldin Ricks’s Thorough Concordance of the LDS Standard Works (Provo, UT: FARMS, 1995), 41–42. Concordance of the LDS Standard Works , 41–42. For more on how others can be like angels in our lives, see Jeffrey R. Holland, “The Ministry of Angels,” Ensign, November 2008, 29–31.